Sequart: Forrest, I understand you’re running a Kickstarter campaign for an emerging-reader comic book? Forrest Helvie: I am! It’s for my book The Adventures of Whiz Bang: The Boy Robot, and it’s running now through the evening of October 8th. 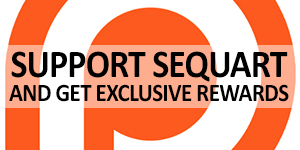 Sequart: What’s the goal you’re looking to get to be fully funded? Helvie: Right now, the goal is $1,140 USD. It’s a modest goal, but we’re really hoping to go beyond that so we can increase the quality of the book itself. Being fully funded would be amazing, but I’d love to see this as a hard cover book that can withstand multiple readings from rough little hands! Sequart: That’s a very good point. It needs to be durable! [laughs] So can you tell us a bit about Whiz Bang? Helvie: Sure thing! Whiz Bang is inspired in part by much of what I read and loved as a kid as well as what I share with my two sons: Calvin and Hobbes, the Fleischer Studios’ Superman, and everything Pixar but especially Wall-E. In fact, I still maintain those first thirty minutes of Wall-E are some of the best cinematic storytelling we’ve seen for children in years – if not more. No words are needed as the animators create this touching story of two robots on a deserted and barren planet. By the time Wall-E takes off after Eve, we’re just as much in love with the characters as he is with his captive friend! And if you look at Whiz Bang – he doesn’t talk. At all. In fact, one of the ways I made sure the comic was working was to have my oldest son, then five at the time, read the story back to me just by looking at the unlettered pages. I’ve spent years writing about stories, but especially since becoming a father, I finally wanted to begin telling stories of my own. Sequart: Agreed about the first half hour of Wall-E. It’s such a remarkable and brave opening for a children’s movie. Anyway how did you move beyond “wanting” and begin “doing”? Helvie: Well, that’s the part where the work began. Since I don’t possess any artistic abilities, I knew I’d need to find someone to work with me to help tell this story, which was originally supposed to be a collection of short stories, but eventually grew into what we hope will become a series of books. I went online to ZWOL.org, posted an “Artist Wanted” ad, and began sifting through the responses I received. In addition to teaching at one of the state community colleges, I am also a freelance writer, so I figured I would use whatever money came in from that work to help pay my artist an advance page rate on work complete. Sequart: And that’s where you met Michelle Lodge – the artist for Whiz Bang? Helvie: That’s right. She sent me a one-page concept sketch, and that was it. I emailed everyone else, thanked them for their time, and I let Michelle know there was no one else who was meant to do Whiz Bang but her. And I have to give Michelle and absolute ton of credit here. Not only does she do all of the line work on the series, but she also colors and letters it. Sequart: She’s a quadruple threat! Can you describe your working process? Helvie: There are kind of two processes – my work and the real work that Michelle does. [laughs] I suppose that’s not fair to writers, but I’ve done nearly every kind of writing there is to do, and I know she’s carrying the lion’s share of the effort here. For my part, anyhow, I just sit down and write whenever I have free time – which isn’t often being a full-time husband, dad, professor, and part-time freelancer for two of the major comics news sites. I don’t get to watch much television or play video games these days, but it’s about setting goals and working to attain them. When I’m done, I send the script to Michelle who begins working her magic. Now, I send her scripts that are written in full format with lots of detail and direction. We’ve spoken about this, and she understand that’s just to help me tell the story to her. From that point onward though, she is completely free to make changes as she sees fit in order to best tell the story to our readers – she’s the art expert after all. Originally, she would have me provide notes on each stage from pencils and inks to colors and letters, but now we’re getting to a point where I may drop full script and go into a sort of Marvel style for a page or two and then shift back. It’s her story just as much as it is mine, so I want her to have fun doing this, too. Sequart: You mentioned that Whiz Bang doesn’t talk. Why is that? Helvie: There are a couple of reasons. First, I think I was intimidated about writing dialogue when I first started, so I began writing the story figuring I could go back and add dialogue later a la Marvel Method. But then Michelle’s art came back and I realized she didn’t need me. The art did everything on its own, and it was amazing! I knew I wanted to write a children’s comic, and I realized the decreased dependence on written language and reliance on my artist’s strength in acting would help me do that. Something I remember fellow Sequart contributor Glen Downey mentioning to me that children’s books needed to mindful of being too text-heavy, and not just text-heavy, but also making use of overly complex word choices and sentence structures. In relying on Michelle’s strengths as an artist to convey the thoughts and emotions of the characters, I was better able to do just that. Sequart: You seem particular to point out that this isn’t all-ages per se but an emerging-reader / early-reader comic. What’s the difference here? Helvie: When I think of “all-ages,” I think of a comic like David Petersen’s Mouse Guard. The artwork is painstakingly crafted and the stories have this mythic quality to them that readers of all ages – young and old – can appreciate, but to truly dig into that text, most of those younger readers are going to need to have an adult help them out to understand the story in its entirety. And believe me: I’ve read Mouse Guard to my oldest, and he loves it, but I don’t think he’d truly be able to read all on his own just yet. Whiz Bang is a little different. I wrote this book so that those younger readers can sit on their own for ten or fifteen minutes and read it. Even if they’re still learning to read, the simple, straightforward page composition and clean, expressive artwork will allow them to quickly figure out what’s going on in the story with or without the dialogue and captions. But I also wanted to tell a series of stories that would provide a little depth and open up some conversations between older family members and their children about important topics like being brave, helping people, and not judging others. Sequart: How did Under Belly Comics come into the picture? Helvie: After finishing a few of the short stories for Whiz Bang, I did what any hopeful comic creator does: I developed a pitch package and began hitting the streets! Under Belly’s co-publisher, Adam Jack, got back to me right away and he was really enthusiastic about what he saw. We started talking and not only was he interested in publishing our stories, he wanted a whole series to help spearhead the first comics for their children’s imprint, Fuzzy Belly Books. Here’s the thing: We’ve all heard about the horror stories from Kickstarter where creators learn the hard, and expensive, way to run a campaign. Under Belly uses a Kickstarter / Pre-order model and they’ve gotten to be pretty successful at publishing books this way. So instead of dealing with all of the nuts and bolts, I can better focus on writing the story and working with Michelle to make sure the final product will deliver as satisfying and memorable a reading experience as possible. Sequart: As we wrap things up, what’s next for Whiz Bang? Helvie: I’m already deep into writing the second book, and Michelle’s nearly finished with the first five pages of the next volume. Something I learned over the course of talking to dozens of creators is to seed enough possibilities for future stories while ensuring the one you’re telling now is complete and coherent enough to stand on its own. If we do our jobs right, you’ll love what you read but want to come back for volume 2! Sequart: So how can we find you? Helvie: You can find us all on Twitter! I’m @fhelvie. Michelle’s handle is @comiclodge, and Under Belly Comics can be reached at @MrAdamJack. Sequart: Sounds great! Good luck with the campaign! Tagged children, children's entertainment, early / emerging readers, Forrest Helvie, Michelle Lodge, The Adventures of Whiz Bang. Bookmark the permalink.